Whip up irresistible icings and unforgettable frosting with this 10X powdered sugar! Also known as confectioners' , or icing sugar, this product is perfect for commercial kitchens looking for a quick dissolving sweetener. Powdered sugar, made from refined, ground granulated sugar, contains a small percentage of added cornstarch to prevent caking and is typically used to make icing, frosting, and cake decorations. Nice powdered sugar. i found it was pretty comparable to the Domino powdered sugar I typically buy. I use it for all of my buttercream recipes. I would repurchase again! I like using this sugar to make homemade vanilla buttercream which requires the powdered sugar to be sifted through a sifter. This is an important step to incorporate air into the mix and make the buttercream extra light and fluffy. The sugar works great! This is a good product for the price. I deducted one star because I received a different brand and packaging than the picture on the website, but the powdered sugar was just fine. purchased this 10 x powdered sugar to make icing for the cake decorating tips that i purchased.it worked out fine and was much cheaper also. This is great powdered sugar for my needs. I use it in baking, and also when dusting the edges of my naked cakes before placing fruit or flowers. This powdered sugar is great for making glazes and frostings, but not so good at coating donuts. It is not as fluffy and powdery as many other brands I have used; instead, this brand has more of a clumpy texture that needs to be broken up. It still works amazing for my glazes though! For the price this is the best powdered sugar around. You’ll end up saving even with shipping compared to buying it at the store. It’s better to buy in bulk. I am very picky with what powdered sugar I use in my buttercream icing & I must say this is fantastic! It mixes well & I have the fluffiest icing! This powder sugar had great sweetness and perfect consistency. I am using this for my funnel cake business and it's great price for quality of product and quantity. The 10X Powdered Sugar is a great value. It's better than what you would find in your local grocery store. Highly recommended for anything needing powdered sugar. 10x powdered sugar is a great product and comes in convieient to use small boxes. They were delivered fast and are fresh. We will be ordering again. This powdered sugar is great. At first I was concerned because it is not made in America, but I shouldn’t have worried—The quality of the box I received is outstanding. just your basic confectioners sugar.great for icings frostings.i also use this for sugar doughnuts.as good as any other brand and price is also better too! This one pound of 10X Powdered Sugar was delivered quickly and I appreciate the ability for rapid reordering!! Definitely a time saver. I was impressed in the shipping box this was delivered in and I would highly recommend this sugar. Easy to use and at a great price. I have also found customer service to be both knowledgeable and helpful. I would highly recommend. This powdered sugar is delicious and affordable. Great on top of pancakes or to make frosting. I've looked around and you can't beat Webstaurant's price per pound. Great price for a pound of powdered sugar. This is perfect if you make a lot of desserts. I've mostly used mine for french toast and covering berries. The 10X Powdered Sugar - 1 lb. Bag is great. We use it on pancake, waffles and in many recipes. The price is very reasonable and it's very good in taste. I am very pleased with this powdered sugar. This powdered sugar is great at being able to sweeten baking dishes without adding grit to them. I'd use it for any sort of delicate baking! Great powdered sugar on my toast. Tastes great and very fresh, store it well to make it last, fits in the 10oz shakers for breakfast too. this powdered sugar was awesome . it was a good quality for a good price. it's definitely better to buy things like this in bulk, but if you only need a little this is solid. Pretty standard confectioners sugar. Like most other versions, this has corn starch as an anti caking agent. If you don't want the starch, you'll have to grind sugar yourself. This works great for dusting over pastries and any other recipe that calls for powdered sugar. Great value and quality not compromised! Used on funnel cakes. Sugar was fresh, not clumpy...very airy and soft. Box made for easy storage after use. 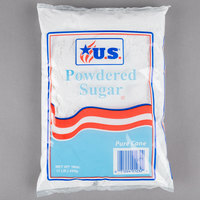 I'll be buying this powdered sugar many more times from WEBstaurantStore it's perfect for so many sweet application's and at a good price you can't go wrong with this product. This sugar has a nice fine and consistent texture. You can't beat the value. It makes a nice topping for many baked goods. It's perfect for those who just want a bit of sweetness for non sweet goods. Yummy powdered sugar comes at a great price and quantity! It has a fine texture and I found I didn't need to sift before using! Sugar is a standard 10x. We use them for our savory breakfast dishes and this is a good price if you can combine shipping on these. Excellent powdered sugar for the price!! It is just as good as ones you would find in the grocery store just a little cheaper. I would recommend the product. This powdered sugar is pretty good. Nothing out of the ordinary, but the price is good and it has such a multitude of uses. I would recommend picking some up. This powered sugar is so fine I don't even have to sift it. I use this powered sugar all of the time. I bake all the time with very few frosting recipes not needing powdered sugar The taste is great. beats with butter easily and doesn't leave a grainy taste in my butter cream frosting. A great value for a large quantity fo powdered sugar. I was worried the box would spill/leak during shipment, but not one bit spilled into the box. The sugar tastes and looks fresh as well. Love it! Works great for Macarons and buttercream and sifts super easy! And its really convenient that it comes in 1lb boxes, 5/5 I would definitely buy again. I bake in high volume with wedding cakes. Measuring for the buttercream alone can be a pain!! However these are the perfect size to just dump the bag in and keep moving. It's worth a few pennies to save that time!!! I bought the 10x powdered sugar to use in my frostings and sprinkle on my cookies. I was seeing smaller bags in the stores and i was happy to find a 1lb bag, especially at such a price! thank you Webstrauntstore! I bake a lot. Best to purchase 10x sugar is this way. I never run out after baking grandkids their favorite baked goods this summer. I thought I'd give this a try and so far so good! I have no problem with the taste at all. I like that it comes in a box, easier storage. I'm used to buying the 2-lb in a bag and its harder to store it. I love the taste of this powered sugar, it works great for all kinds of sweets! It ships fast too with is a big plus! A nice size box of 6X Powdered Sugar. This is great for making icing and the price is wonderful. Very happy with this item. Sweet and Smooth taste. The 6X Powdered Sugar - 1 lb comes packaged in the box shown and the box is wrapped in a bag. The sugar is a bit more clumpy than I am used to. When I ran this sugar through the sifter, I had so many pebbles that hadn't broken down... Maybe because I am used to 10X powdered sugar and it is more fine. I am not sure what caused the clumps. Thanks for your review! 10X sugar is finer than 6X sugar. You may be interested in the 2 lb. Bag 10X Confectioners Sugar, item 104SUGAR10X. Perfect for high volume bakeries and kitchens that need an affordable, great tasting quickly dissolved sugar. Perfect on piled atop beignets or in royal icing!